That’s one question I get a lot from my friends! And my answer is always the same: yes, there are mowers out there that will fit your needs like a glove. The catch? You’ve just got to take time out to find them. As a professional who ornaments gardens for a living, I’ve seen my neighbors using riding mowers that do not fit their lawns. And as a result, their gardens turn out unkempt and ugly. I admit, easy-to-use compact mowers with a powerful engine are relatively hard to find, but it isn’t impossible either. And if you’re in search of one such mower but unable to find it, then Husqvarna’s mowers might just be what you need. But, will their mowers be a perfect fit for you, as it was for me? Let’s find out. What could have been better in the Husqvarna Z254? What about the Husqvarna Z246 that could have been better? When it comes to visual appeal, the Husqvarna Z254 is quite impressive. I found it to be visually very sturdy and on closer inspection and use, it turned out to be just that. This mower is built like a tank. So if your yard has a lot of small undulating hills and bumpy surfaces, you can be assured that it will not topple over no matter what. It has an easy to use clutch mechanism and comes equipped with one of the best airflow systems that the current market has to offer. The fan is extremely powerful in my opinion, and its improved airflow helps in significantly enhancing the mower’s durability as well. The Husqvarna Z254 is one of the more pocket-friendly mowers out there. So, if you need a reliable and powerful mower within budget, then this might just be the right model for you. Here are some of the fantastic features that the Husqvarna Z254 comes with. Husqvarna provides this model with a reinforced cutting deck which reduces the wear damage that the cutting blades would often take during the more difficult cutting jobs. It allows the blades to function a lot better and significantly improves the mower’s overall longevity. Additionally, the Z254 comes with two new features which some of the other Husqvarna models don’t have: the rear engine guard and the auto parking brake system. I noticed that the rear engine guard is quite beneficial in providing an extra layer of protection to the mower to make it much more durable. The auto parking brake, on the other hand, makes the mower safe for users whose yard have a lot of “rolling hills”. If your foot comes off the pedal, the mower will stop automatically, hence limiting a lot of the accidents that may have been caused otherwise. Despite appearances, I found the Husqvarna Z254 to be very easy to use. It comes with an automatic choke system that makes starting the machine as effortless as possible. This is one feature that I really like. Most of the standard mowers come with either a “string pull start system” or some other mechanism which requires a lot of user input. These systems are quite a hassle to use, and the Husqvarna Z254 quite effectively did away with them. In terms of lawn mowing efficiency, the Z254 does quick work of any backyard condition. It has zero-turn radius capabilities which make the mower to have an effective turning radius of zero. It will allow you to mow in reverse and help you tackle the largest of lawns in a matter of hours. The zero-turn feature makes the mower quite mobile, and you’ll be able to maneuver it across the yard quickly if there aren’t many obstacles to look out. The Husqvarna Z254’s engine comes with a very robust and powerful fan which is just vital for an improved mower performance. The fan draws air to the bottom of the deck, thereby providing better grass movement and ultimately giving your lawn a very even trim. 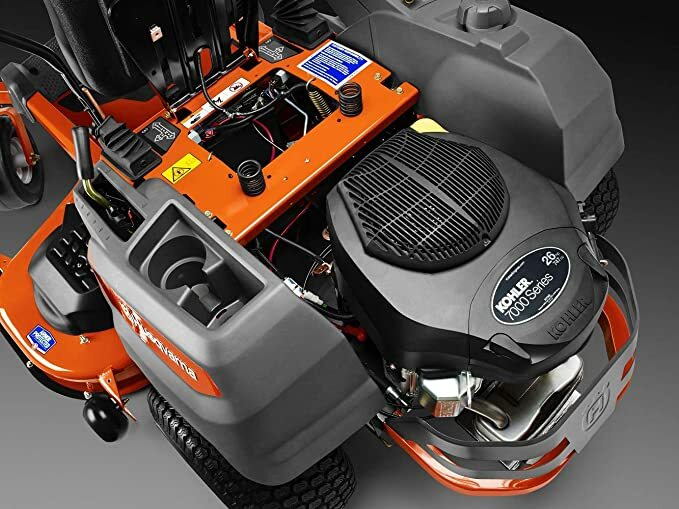 The engine also comes with an improved filtration system; it increases the airflow, reduces foliage block and allows the mower to last much longer. 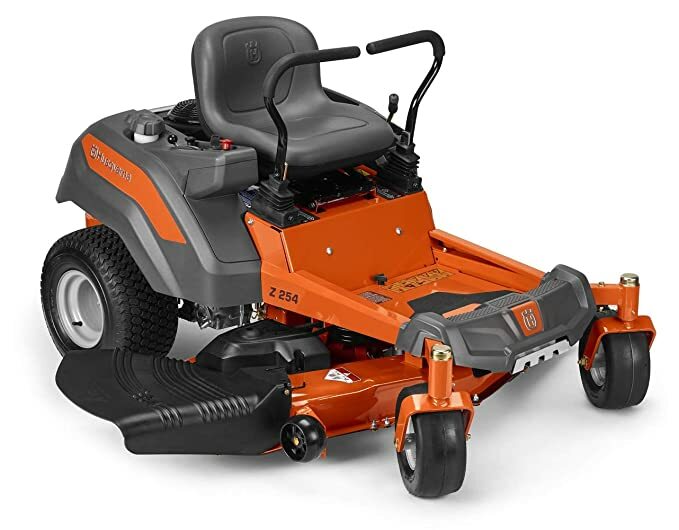 I believe that a good mower is one that supports a reliable engine, and the Z254 comes with a 24 HP Briggs & Stratton V-twin endurance engine which is extremely powerful and highly fuel efficient at the same time. Briggs and Stratton’s engines are more or less the go-to standard for high-quality lawn mowers as they are both extremely reliable and sturdy. The initial issue which I noticed was with the cutting deck. Though it was comfortable and brought all the mower controls at arm’s reach, it can break down easily if there is a lot of grass and lawn debris build-up. For the Z254, the grass build-up on the deck is rather fast. While the advanced airflow system protects the engine from foliage block, it doesn’t do the same for the cutting deck. Because of this, periodic maintenance is a must for the mower. The very tank-like build of the mower grants a high level of durability, but compromises on its maneuverability. The Husqvarna Z254 will not permit you to cut horizontally on sharp slopes. This might not seem like much of a problem for people with smaller yards with even ground structure, but it is indeed a deal breaker for those who have a terrain with a lot of slopes. And even with the zero turn feature, moving this mower around a lot of trees and obstacles can indeed be an issue. If all my years in the lawn care industry has taught me anything, is that when it comes to gardening tools, the competition is rather steep (especially lawn mowers). The product will have to consistently work at the highest standards without fail, as any lapses in performance will lead to an automatic veto. Husqvarna doesn’t joke around when it comes to their mowers. The Z246 Kohler Confident is a beast in all respects, and it comes packed with some of the best features that the market has to offer. For me, the Z246 is one of the more reliable models in the market, and it’s all thanks to the “reinforced steel cutting deck”. This is one of the major reasons why I like taking the Z246 to some of my difficult lawn jobs. The cutting deck is equipped with “heavy flat-stock steel” which guarantees both durability and cutting strength. The Kohler engine, on the other hand, is maintenance free and comes with the latest in air induction technology. This promises a superior cutting capability no matter the job, and as air is being drawn from the bottom and top of the deck, it allows the mower to have improved grass lift as well. I am not a big fan of riding mowers which boast amazing cutting potential but is not convenient or comfortable to use. And I have no complaints towards the Z246 in this regard. The deck has a perfect lift and comes with a spring assist system making it easy to use and comfortable to sit on. The control panel is quite ergonomic as well, and I didn’t have to struggle at all while using it. The panel is designed in such a way that it brings all the mower controls at my very fingertips, making for a hassle-free and enjoyable mowing experience. For reduced chassis flex and deck durability, the mower is also designed to be fitted with casters along with a sturdy frame. I won’t be exaggerating if I said that the Z246 is built like a tank, and it traverses over rugged lawn conditions with relative ease when compared to most of its competition. The chassis has a very unique tube-like design and will be able to provide you with removable foot pans. I found this to be quite convenient if I ever needed to have easy access to the deck’s upper part. The one-of-a-kind cutting ability of the Husqvarna Z246 mower is all about maximizing your output and making quick work of the most difficult of lawn jobs. It has three cutting methods of mulch, rear bag and side discharge, which is popularly known as the “3 in 1” feature. The grass cutting sizes can be easily adjusted as well. So if you have a backyard with a lot of overgrown grass and weed, then don’t worry as the Z246 has got it covered. Moreover, the mower is an amazing workhorse and can effortlessly go through 2.4 acres well under an hour. 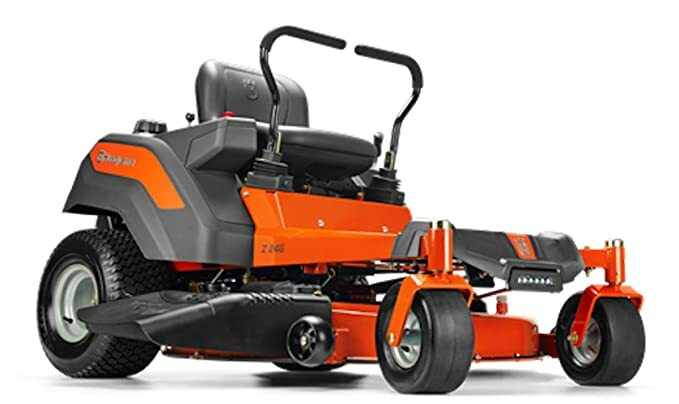 For a riding zero-turn mower, the Z246 boasts an amazing amount of power and longevity. However, I found the mower to be quite hard to handle on wet slopes as it tended to tear up the lawn if I wasn’t attentive. Maneuvering the mower in a smaller lawn or a lawn filled with a lot of trees is difficult as well. So if you have a yard densely populated with foliage, then this may not be the right zero turn mower for you. Can I use the mower to cut in reverse? Of course! But be careful of ground obstacles when doing so. And as the mower is a very powerful machine you might run the risk of tearing up your yard as well. So, be attentive when planning to use the mower in reverse. Does it come with a mulch bag? No, it doesn’t. For the mower’s bagger system, you will have to buy the parts separately. 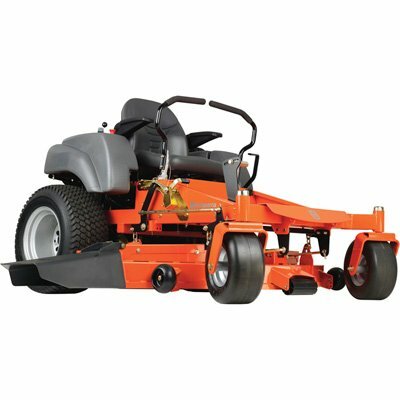 What is the cutting height I can get with the mower? The cutting height of the mower is variable, with a minimum of 1.5 inches and a maximum of 4 inches with a cutting width of 46 inches. I’ve been using the Husqvarna MZ61 for some time now, and I must say, it has yet to fail in getting the job done. To be able to exploit its merits thoroughly, I recently took on an assignment of trimming the public park. To my delight, the MZ61 made the job smooth and effortless. Let’s take a closer look as to why was that the case. Breezing through 2.5 acres spread in under 50 minutes is not an easy feat for any mower to accomplish. But the MZ61 did just that and more, all thanks to the robust Briggs and Stratton engine built into it. Briggs and Stratton are famous for making engines that are both powerful and dependable. The MZ61’s 27 HP Endurance V-Twin engine is no exception to that fact. And what really puts a smile on my face, is the sound the engine makes every time I start the mower. But well, you see, that’s just the thing, there is no sound. For an engine this powerful it’s amazingly quiet. You don’t have to worry about disturbing your neighbors, the same way I didn’t upset the people trying to relax in the park. Another interesting feature the mower has which made trimming even faster was the large 61 inches cutting deck. Made of high quality fabricated steel, the deck has 3 powerful and robust blades that not only cut the trimming time in half but also increased the accuracy of each cut. Maneuverability was vital when it came to trimming the park. Neither was the park’s surface wholly flat nor was it free of static obstacles like ponds and trees. But luckily, this is where the mower’s hydraulic gear transmission kicked in. It gave me complete control and the much-needed power to mow all kinds of surfaces with ease. Additionally, the zero turn mechanism allowed me to control each wheel individually and zoom around those static obstacles like it was nothing. The Husqvarna MZ61’s attractive, compact build is amazingly easy to use, which not only makes it ideal for professionals but for homeowners as well. A major complaint that customers have for most riding mowers is how increasingly difficult it gets to start them after a few days of use. But that was not the case for the MZ61; it comes with a chokeless start that immediately gets the engine roaring as soon as I put in the keys. And as an added safety feature, Husqvarna made the mower in such a way that you’ll not be able to start it unless you are seated on the machine. On the other hand, the mower will stop as soon as you get up. Sitting for a long time can get very uncomfortable for the back. And mowing is one profession where you have to be seated for extended periods. But while I was attending the park through the majority of one afternoon, I felt no discomfort or added exhaustion. The mower’s high back seat held my back comfortably in place, and the armrests let me access the levers while my arms were still rested. Additionally, as an individual preference, I really like to mulch from time to time. The model allowed me to collect or mulch the grass clippings as I saw fit. Like most gardening tools, the MZ61 too was not free of flaws. I found a few areas in which I believe Husqvarna should improve on. For a mower of this category, the MZ61 felt very expensive. It might just be unaffordable for most homeowners in the suburbs. Due to the zero turn system, I found that the MZ61 compromised on the traction for extra mobility. It was impossible for me to trim the wet marshy patches near the ponds. Does the MZ61 allow bagging storage? From mulching to collecting the grass in a bag, you can do whatever you please with this fantastic mower. Will this mower suite my large trellis garden? This product is powerful enough to traverse the biggest of backyards. The great transmission and zero turn mobility will allow you to avoid the flower beds as you trim your garden. Husqvarna’s mowers might be expensive when compared to the rest of its competition. But Husqvarna goes a step further in keeping their customers satisfied. And for that alone and the fantastic user experience I got, I would recommend their mowers to any professional or homeowner. If you take mowing the lawn as seriously as I do, it would be worth taking a look even if you aren’t exactly raring to make the purchase. Thanks for reading my Husqvarna zero turn mower reviews. Till next time!